When it comes to pens, most people think about the humble, disposable plastic pen. But, when it comes to a collector-grade, handcrafted pen, there are quite a few choices for selecting the material from which to make a pen. Some non-traditional materials for making pens include antler, horn, hard-surface materials, synthetic metals and stone. For as long as mankind has been making tools, we have been using animals to help make our lives better. Whether it has been harnessing their power to plow a field or using their skins to keep us warm, animals have made our lives better. We have used antlers and bone to make tools for hundreds of thousands of years, so why not use these materials to make instruments with which to communicate. Pen bodies can be made out of antler, bone and other materials. In fact, the original ink pens used 'quills', which were flight feathers of large birds (such as a goose or swan). 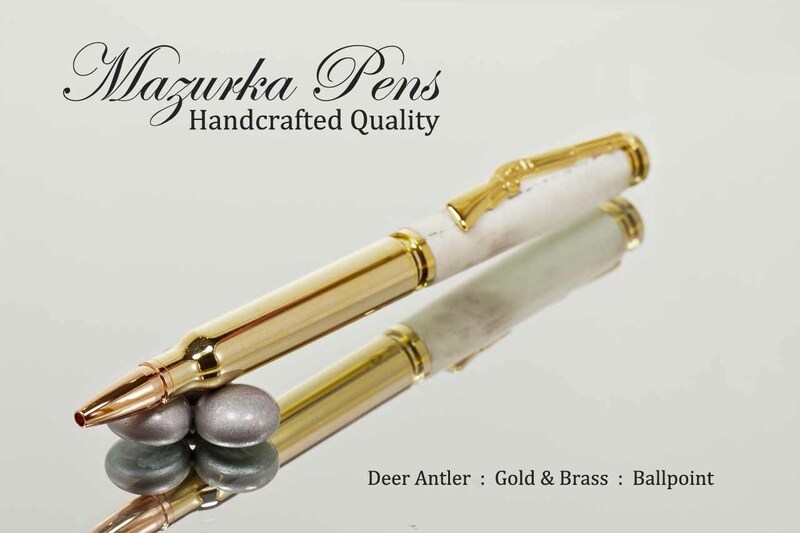 Today, antler and horn are the primary materials used in the making of custom pens. The antler and horn turn nicely and polish to a nice finish. Often, an additional finish is added to give a real glass-like appearance to the final product. Horns can be used as well, as they are similar to antler in its ability to turn and hold a shape. Horn can be a challenge, as it can be difficult to turn, shatters easily and is often hollow. But, when completed, it looks great. Often, horn is used as an accent on the design of a pen. Man is great at making synthetic materials. While acrylics, plastics and resins are often the 'norm' for making pens, there are many other options that are not as common. Corian is an example of one type of hard-surfaced material. Commonly used in high-end kitchens and baths, this product can be turned to make a very durable and nice looking pen. Or, it can be combined with other materials as an accent piece offering many creating options. Synthetic metal materials are an option, where a metal is essentially turned into a powder and mixed with resins to make a product that looks like metal, but turns more like a plastic. These materials are fantastic looking, but are quite expensive, easily running 10 times as much as other materials, such as wood. Of course, it is possible to make a pen body out of 100% metal, the most common being stainless steel. But, if you have access to the materials (copper, steel, etc.) and the right equipment, you can make a pen out of any metal. But, this is a very time intensive process, prone to mistakes. One other option is a synthetic material called TruStone, which is also used for high-end counters, bath and shower applications. This material is very popular for turning projects and makes a great pen body. It is difficult to turn, as it is essentially powdered stone combined with resins as a binding agent. But, it is well worth the effort as it polishes nicely and looks great. Polymer clay is a plastic-like material that is easily workable yet it becomes a solid once baked. Polymer clay is composed of polyvinyl chloride (PVC) material that often can contain trace amounts of clay. Although it may contain trace amounts of clay (and other materials), it is really only called clay because of its similarity to working with traditional modeling clay. It is available in a number of colors and from several manufacturers. These colors can be combined to make new colors, mixed to create patters or combined in a number of ways. Creative use allows a good simulation of wood grain or it can be use to create stunning patterns and designs. The options are unlimited. 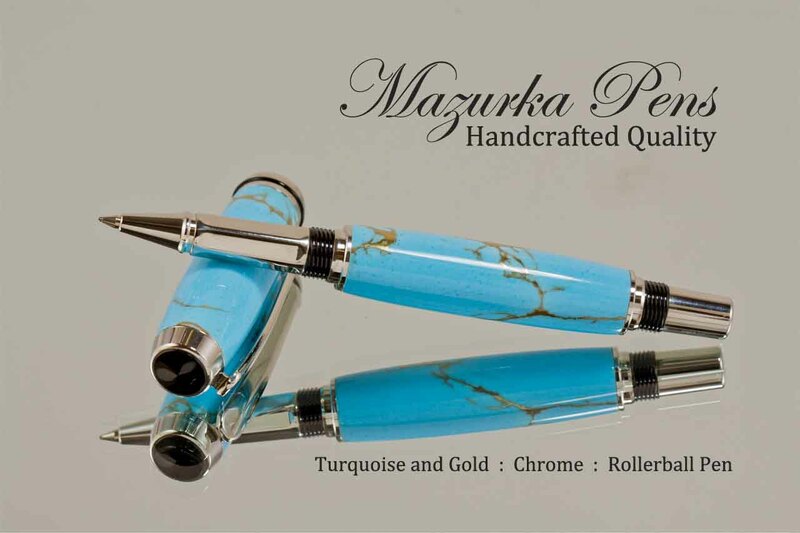 There are many alternatives to the traditional wood pen. Any of the above a great ways to branch out and find a pen with a unique quality that really makes an impact. Consider these as alternatives for your next pen.